They are cute, they are cuddly, they are extremely beautiful and lights up the room. Dogs are a man’s best friend. But this best friend can sometimes make a mess of some things. You just brought in that new carpet and Tommy decided that is his new bathroom. Or maybe you were rearranging your carpet only to find a surprise. These things happen. The question remains, how do you remove the dog’s urine stain from the carpet? There are two types of stain however. There is a fresh stain that is probably wet and an old stain. 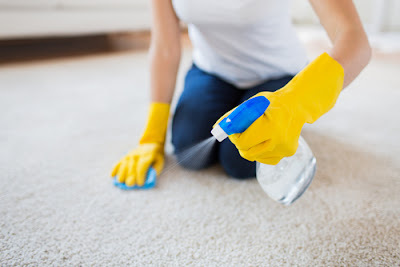 We are going to break down the tips of how you can remove both of these stains and restore your carpet into its former glory. Use a wet towel or those which are topped by a heavy weight to quickly absorb the fresh puddle. You have to run the paper towels on cold water to wring them. Make sure they are have a bit of dumpness but not dripping. Place them on the affected area then place something heavy on them. The moisture from the towels help soak up the stain. Leave these towels on the area for around 10 minutes. After you have removed the wet towels, pour a bit of cold on the spot. To avoid the stain from spreading to an even wider circle, it’s advisable to start pouring the water from the outside perimeter coming to the center of the stain. Give the water about a minute or so, to work on the stain. This helps to clear out the stain and odor. The non-toxic enzymes helps break down the stain into their basic compounds. Using these enzymes, it’s the best method of breaking the compounds of the proteins left behind by the urine. This will also eradicate the impulse for the dog to urinate on the same spot once again. Just like you did in the first step to absorb the stain, use the fresh set of towels to soak in the cleaner. Remember to weigh them down. Clean the spot thoroughly before with the cleaner before placing the towel. When you pull up the towel from the spot in the morning, both the stain and smell should be gone. Pets are pretty good on hiding their 'bathrooms’. Once the stain has dried up, it becomes a bit difficult to locate. You can however know where it’s located by simply following the odor or by using Ultraviolet light to explore. The best time can be at night or you can make the room dark. Once you have located them, mark the areas so that you can know where to start cleaning. Once you have located all the scenes of crime, start by pouring a little cold water. Just like you did with the fresh stain, pour the water beginning from the outer perimeter coming towards the center. Spray the enzyme cleaner and let it stay overnight. In case yiur carpet is made of wool, make sure you are using wool –safe cleaner. Run the towels on cold water but make sure they are not dripping. Use a heavy object to hold these towels on top of the spot and let it stay overnight. When you remove the towels in the morning, you can assess and see whether you need to take more extreme measures. The rented steam cleaner can do the trick. The cleaner does produce steam that is hot enough to sanitize the carpet. You can do this yourself but if you find the spot large or stained, you may consider hiring a professional cleaning company. This is an excellent alternative to using a steam cleaner. Oxidizing products are effective in removing odor. You can make an oxidizing product yourself. Mix two tea spoon of bleach with 950ML of distilled water. Do a test on a minor part of the carpet to see if it’s safe to use on your carpet. It should be noted, Oxidizing products should NOT be used on silk or wool carpets. Use them for synthetic fibers only. Wet the spot and vacuum it as many times it will require to clear out the stain. Don’t let the water stay. Vacuum it as soon as possible, usually within seconds after each application. For tough stain, add a bit of salt into the water. Make sure you never use soap with this method as the residue left over the carpet will attract dirt. Spray the spotted are with vinegar and enough suficient baking soda to cover the spot. Cover up with a towel and leave it for 24 hours. Wash the spot with cold water thoroughly. The area should be cleaned and the stain gone. It’s cheaper and affordable. Stain the spot with with a minor coat of baking soda. Stir the cup of hydrogen peroxide with a table spoon together with dish soap. Place the mixture in a spraying bottle and shake gently. Saturate the spot sufficienty with baking soda. You can use an old toothbrush to massage the area. Let the mixture dry up. Vacuum up the dried mixture and clean with cool water. Keep in mind, hydrogen peroxide can damage some types of carpets. Do a small test to ensure it doesn’t leave an irreparable stain. Ammonia should never be an option for cleaning the pet stain. This is due to its high alkaline. It usually leaves a sticky residue and destroys carpet fibers attracting debris and dirt. Ammonia also contains some salts and uric acids that are present in urine. This will make it tempting for your pet to mark the territory. Stay away from Ammonia. 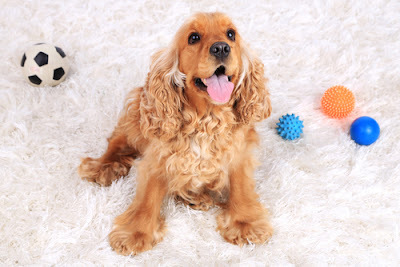 Just because you carpet has been stained, it doesn’t mean you have to throw it away or kick your dog out. These methods have proven effective in settling and diffusing the Mexican standoff between your carpet and your dog. If you have tried all the above methods and the stain still remains, please seek the help of a professional.